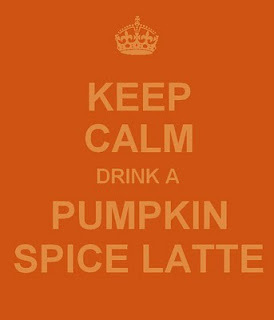 I have been looking forward to Pumpkin Spice Latte season all year, but those suckers can get expensive and are really high calorie. I was looking for something to fill my pumpkin spice needs, so I was thrilled when I found Pumpkin Spice Kisses at the grocery store. My advice to you is stock up on these now! 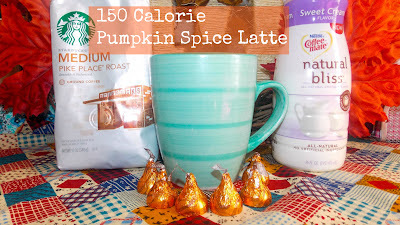 Not only do these taste incredible, but they are the perfect ingredient for a DIY pumpkin spice latte. Brew your coffee strong. Drop 2 kisses into the cup while the coffee is still really hot. Once the kisses have melted add your creamer and Splenda if you want it a bit sweeter. 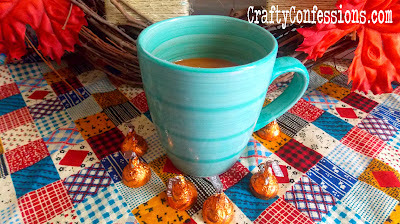 Here is a breakdown of your calories: 2 Kisses = 46 calories, 3 tbsp creamer = 105 calories, coffee = 0 calories. If you add sugar and whipped cream it will be a bit higher. If you still want to splurge, this pairs perfectly with a piece of delicious pear crisp. You can find the recipe on Paula Deen's website. Or...if you want to keep with the pumpkin theme, you can try my recipe for pumpkin chocolate chip mini loaves. Yum! Gettin' my link on with THESE great parties! I love pumpkin spice lattes! Stopping by from Financial Friday! Thanks for sharing! Thanks for the idea. You make it sound so easy! Now I need to make this! Sounds yummy and I love the low calorie part almost as much as the coffee-pumpkin part! Wow! 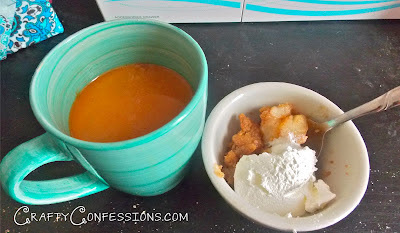 This seems like such a simple and yummy way to get my pumpkin fix this fall. Thanks! Wow, less calories AND cheaper than going to Starbucks?? LOVE it! Thanks for sharing! I'm your newest follower and would love if you'd check out my blog! Have a great night!! Mmmmmmmm! What a fantastic idea. Easy and delicious! Greate article Very informative and useful articles. This is a nice post in an interesting line of content.Thanks for sharing this article, great way of bring this topic to discussion.